Garage Architect improves technology of parking and security and door operation. Our home architects accomplish this in ways that are concealed and subtle, ensuring that our trademark “Timeless Mountain Aesthetics” are preserved. For instance, as a garage architect, we now specify the Laser Guided Parking Assist in our garages as an owner-optional upgrade. Sounds like Star Trek, doesn’t it? It is really rather simple as well as economical. Each device retails from the manufacturer for about $24. As a garage architect, we keep up to date on the latest features involved in what amounts to your personal entrance to your home. Image courtesy of SmartHome. The central laser broadcast station is positioned in the middle, between 2 car parking locations. When you click your garage door opener, the laser activates. The laser light has been pre-directed to a specific location on your dashboard, so that as you advance into your garage, the light harmlessly runs over your hood and on to the designated location, which you know is the proper spot at which to stop your vehicle. Only a well-informed garage architect knows about such economical and highly functional features for your garage. An adjustable laser light is installed over your ideal car parking position in your garage, in the front third area, with a laser clear line-of-sight to your dashboard. When you press your door control from your vehicle as you approach your garage from outside, the laser activates. 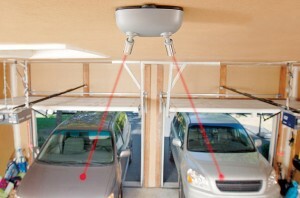 As you enter your garage and approach the far wall in front of you, the laser will, at some point, run harmlessly over your hood and onto your dashboard, until it contacts a pre-determined point that you can easily see from your driver’s position and recognize as the perfect location for your vehicle in a parked position in your garage. In about 60 seconds, the laser turns off. Much nicer that the old dangling tennis balls or magic marker lines on the wall, huh? Pretty nifty, if we say so ourselves. It takes a real garage architect to understand luxury residential architecture at this level, even in your garage. (C)Copyright 2009-2010 Rand Soellner, All Rights Reserved Worldwide. Anyone may link to this webpage from your website with your anchor text of: garage architects. Just one example of the various decorative design treatments employed by garage architect Rand Soellner on one of his projects. (C)Copyright 2005-2010 Rand Soellner, All Rights Reserved Worldwide. Garage architect design example. 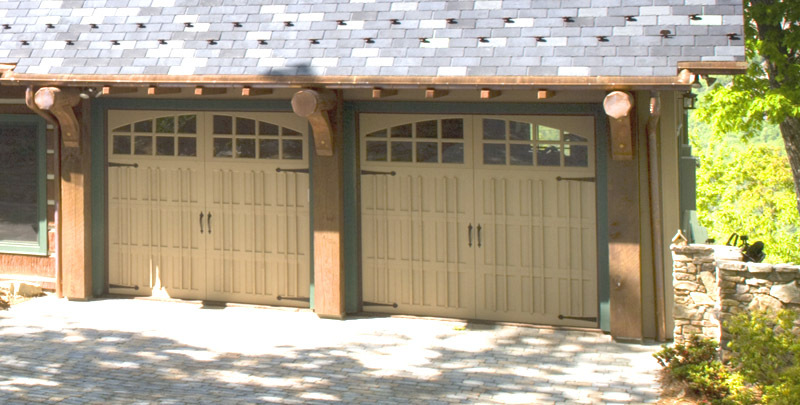 Garage Architect adds detail to standard garage doors turning them into something special. Another example of Rand Soellner Architect’s decorative treatments to garage doors. All of Soellner’s garage doors are motorized and are operated from your vehicle’s remote control button, and roll upward to the garage ceiling. The appearance that these doors are side hinged from a previous historic era are simply the result of the garage architect design. (C)Copyright 2003-2010 Rand Soellner, All Rights Reserved Worldwide. Garage architect plans for a better garage door opener. Continuing in our role as a garage architect: How about A Better Garage Door Opener. Have you ever driven up to your home on a cold, rainy night and pushed your garage door opener to find that nothing happened and your power was out? What an unpleasant situation. Do you have your spare keys to your home’s front door? What to do? Well, we now specify, as an owner optional upgrade, a ¾ horsepower garage door opener with a standby emergency power supply. It is also a new breed of belt-drive openers for smoother, quieter operation. What a relief! Your garage doors will always open now, regardless of what has happened to your home’s power source. A garage architect should pay attention to such details. 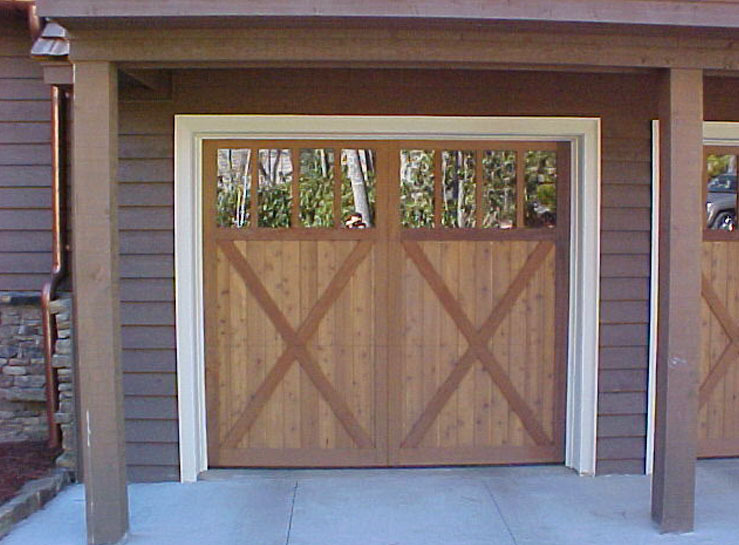 Notice that we offer the upgrade to a ¾ HP motor, recognizing that garage doors to fine homes are often heavier, with nicely finished wood species like mahogany, with applied accent trims, which makes them harder to open with conventional door openers. We also specify electronic door access code openers, as a garage architect. These devices change the code every time they are used, which thwarts criminals trying to gain access to your home, because, even if they have successfully recorded your electronic signals opening your door, the signal has changed! Also, as a garage architect, we offer state of the art (and remarkably economical) fingerprint I.D. entry devices for your garage doors, so that no one having a series of combination numbers can get access into your home. If their fingerprints don’t match those that you have recorded into the device, they can’t operate the door from that device. Please give us a call to see how we can begin designing your dream home with garage architect features like this and many more, in our capacity as fine luxury residential designers. You may find it of interest to know that Rand Soellner was part of design and construction document architectural teams for several commercial large parking garages as well as for residential projects. This well-rounded experience gives Soellner a tremendous amount of knowledge regarding garages for vehicles of any size and type. In addition to being a garage architect, the Rand Soellner firm is a custom home architect. Soellner creates designs for clients across the continent and world, wherever your project may be located. We are also often referred to as a mountain homes architect, although we design houses for a variety of people in a variety of locations. For instance, our services are available to design your home, even if your project site is in South Bend Indiana, Bend Oregon, San Antonio Texas, Asheville North Carolina, Atlanta Georgia, Macon Georgia, Orlando Florida, Jacksonville Florida, Taos New Mexico, Vancouver British Colombia Canada, Calgary Alberta Canada, Lake Mead Nevada, Lake Lure North Carolina, Lake Norman NC, Charlotte North Carolina, Greenville South Carolina, Savannah Georgia, New York New York, Oak Park Chicago llinios, and just about anywhere in the USA and the world. tags for social media: garage architect, luxury residential design, home architects, custom home design, highlands architects, cashiers, asheville architect, post and beam, timber frame, mansion architecture, cottage, log home, green home, cottage, healthy home design.